A few months ago we talked about one of my favorite cross training activities — swimming! Although I focus a lot of time and effort on running there is a secret that this girl keeps…. I love triathlons. So far I have only completed one sprint distance triathlon; however, I have really made it a goal of mine to train for a Half Ironman — along with doing a Century Ride (100 mile bike ride)! I have come to the conclusion that doing a Half Ironman just isn’t going to happen this year. The swimming portion will be the most difficult part and I have not spent near enough time in the lake/pool training for the swim. However, I am registered for the Tour de Livingston bike ride this coming October. (I am super excited to be riding in this event!!) The Tour de Livingston offers a 5, 10, 27, 38, 62 or 100 mile loop. I have not decided yet if I am going to aim for 62 mile course or if I am going to shoot for the works — and sign up for the 100 mile course!!! Well, there is a secret that many of us who run and cycle know — biking is hands down one of the best cross training activities you can do to complement your running. It roughly simulates the motion of running and it can actually help you improve your running speed. While running benefits your calves and hamstrings, it largely ignores the front leg muscles that biking helps workouts — muscles like the quadriceps and if you are using clip-in shoes your shins. By strengthening the muscles opposite those exercised by running, biking will help you improve your running performance and help you avoid injury. The benefits should also show in your race times — as studies have shown that regular intense biking workouts can shave as much as 10 percent off your 10k finish time! In terms of fitness benefits, three or four miles of biking equals about one mile or running. The real trick to biking is to find a place where you can really push your pace enough to get your heart rate up as high as you would with a run. If possible, you want to find a route that requires you to slow down as little as possible — no turns, no pedestrians, no stop lights, no traffic. I know it is not an easy task, and at the end of the day you just have to ride where you have available. HOW CAN BIKING MAKE YOU A BETTER RUNNER??? 1. It is a great form of active recovery — It is a story that is as old as running itself: You do a long run on Sunday and come Monday morning, you can’t force yourself to get off the couch much less do any sort of any activity. For many runners, an easy jog the day (or two) after a long-hard run is about as much fun as having a root canal done. (Fun, right!) But active recovery, such as moving your legs with an easy bike ride can increase blood flow, flush out lactate, reduce muscle and joint stiffness, and can help you get back on the road sooner than if you were to just sit on the couch. 2. You will build strength in complementary muscles — If your workouts are exclusively consist of running you are only building up certain sets of muscles to perform certain functions. Though your running muscles will become stronger initially at some point you will plateau. Doing the same thing every day will eventually mean you will stop yielding results. When you start to bike you are using muscles in your legs and core that complement the muscles used for runner, which makes you a stronger, more efficient, and yes — faster runner! 3. Your ankles, knees and hips will thank you — Runners, especially those who do longer races (like marathons and ultras) put a pounding on their bodies. Because of this it is hard for some runners to maintain high weekly mileage without causing repeating injuries. Biking will give you a good workout without the impact of running. If you are not comfortable with replacing an entire run workout with a session on the bike, even substituting a portion of your run with a bike ride can make your joints happy. 4. You can replicate the feeling of a long run without actually doing a long run — The secret to this something called the “Brick Workout” where you go from a bike to a run with no interruption in between. Though the term “brick” really refers to the two disciplines pushed together into one workout, some athletes (myself included) will swear it actually refers to the fact that running immediately after you get off the bike will make your legs feel like bricks (after they are done feeling like jello)! If you have never done a brick workout before, you really should ease into doing these very gradually. Start with a 10 mile bike ride at a decent pact, and immediately follow your ride up with a 1 mile run. Your legs will feel sluggish, as if you have already ran a long way, but they won’t have taken the pounding they otherwise would have. Focus on maintaining good form and finishing strong. If the 10:1 brick feels good then you can gradually increase your mileage for the bike and run. Some will tell you it does not matter if you have mountain bike, a road bike, a hybrid or a triathlon bike; however, I would strongly suggest you invest in a road or hybrid bike if you plan on riding further than 10-15 miles at a time. The most imporant factor is that you buy a bike that fits you! Visit your local bike store to check out all the options! Make sure you have the essential items for biking: a helmet, bike shorts (these are lifesavers, trust me! ), and a seat bag! Here are some optional items: bike shoes and pedals which clip together (I use them a love them!) and a biking computer. Before you go on your first ride make sure you know how to change your tires if you get a flat. If you do not have a friend who bikes and can teach you, visit your local bike store and they will be happy to teach you! The most important tip: be safe and obey the rules of the road!!! Make sure you ride with traffic, not against it! The weather in Michigan has finally improved enough for me to pull my brand new bicycle out for the first ride of the year, and I am super excited. For the last two years I have ridden a 20 year old road bike and this winter I finally talked Mark into letting me buy a new bicycle. 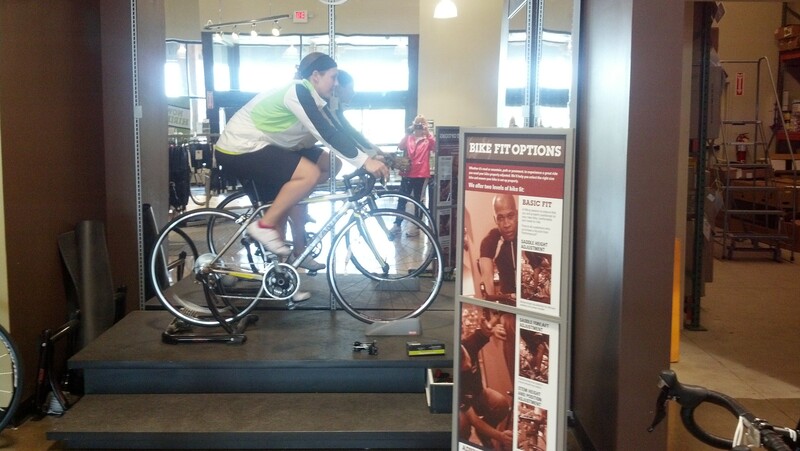 Early in the year we made a trip down to Performance Bicycle in Novi, MI to pick out my new bike. After two hours of looking at all of my different options, Mark having a heart attack that a $1,300 bicycle does not even come with the pedals (which we had to purchase separately for an additional $40), and weighing all my options I finally pick out a Scattante Carbon Road Bike. Performance Bicycle has great staff to work with, great purchase and return policies, and when you purchase a new bicycle it comes with a free bike fitting. Having my free bike fitting done with my new road bike. For those who are seriously interested in bicycling, I would strong suggest you get pedals that allow you to use “clip-in” shoes. As a newer bicyclist I was not fully ready to commit to riding with clip-in shoes, because honestly — I am not even close to graceful! (Mark always teases me and says if he could wrap me in bubble wrap before I left the house he would!) I really wanted to try the clip-in shoes but I wanted to make sure I had the option to still ride in tennis shoes if I wanted — so at the end of the day I bought a type of pedal that allows me to do both! Here is an example of the type of pedal I bought. So, why should you look into clip-in pedals? Clip-in pedals (as I call them) are a two-part system for you and your bicycle. Part one is the pedal with the locking mechanism and the second part is a cleat that is attached to the bottom of your bike shoes. The shoes clip into the pedals which give you a very solid connection to your bike. While I call them “clip-in” pedals — their real name is “clipless” pedals. A sample pair of clipless biking shoes with the clip attached to the bottom of the shoe. 1. You will get better power transfer: One of the best things about going to clipless pedals is you will have an extremely solid connection to your bike’s power. With normal pedals there is only one thing keeping your foot on the pedal when you are on your upstroke — pressure. As a rider you have to maintain constant contact with the pedal throughout every rotation and to do that you have to apply a little bit of pressure on your downward movement. With clipless pedals your foot cannot go flying off the pedal and you can fully unweight your feet on every recovery stroke, so all your energy is dedicated to propelling you and your bicycle forward. 2. You will greatly increase your efficiency: When you are using the traditional platform pedals, there is only one section of the rotation where you can apply pressure to them — the downward stroke. While the downward stroke is generally the most powerful part of your stroke, clipess pedals make it was better. Not only can you have a powerful downward stroke, but because your feet are anchored to the pedals you can sweep back up and pull. It will take some getting used to, as you will be asking your legs to do more things at once then they are used to doing when bicycling. Once you adjust to the timing though, you will find yourself going a lot faster with much less effort. 1. Disengagement: It is possible for your foot to accidentally become disengaged, and if that small, sharp pedal whips around and hits you in the shin — well, it is going to hurt, and hurt badly! There is also the off-chance that you will want (or need) to bail and get off your bike in a hurry — a major hurry. Well, while using clipless pedals there is an extra step to getting your feet off of the pedals now. Practice training yourself to disengage your feet lighting quick so when you need to you can detach yourself quickly. 2. Heavy traffic: Clipless pedals can be an issue for riders who ride in the city or encounter a lot of heavy traffic. Every time you stop you will have to clip out at least one of your feet (if not both) and when you start up you will have to clip in again. Trust me — this will take a fair amount of practice before it becomes second nature. 3. Falling: This is not meant to scare you but EVERYONE (myself included) will eventually tip over and fall while learning to use clipless pedals, at least once! Yup, I did it! I did it the firs time out on my brand new bicycle, while standing still with only one foot clipped in! You should practice with your new pedals in areas with as little hazards as possible — and do not use them in a bike race until you are comfortable with them because if you are not comfortable using them you could literally seriously injury or kill yourself or someone else. Now that you have a little bit of information on bicycling and the weather has gotten nice — make sure you get outdoors and give biking a try! In 2011 I began to train for my first sprint distance triathlon, the Trek Women Series Triathlon which I completed in August of that year. Besides the Marine Corps. Marathon, this is by far my favorite athletic event I have ever participated in. The personal determination it takes to complete a triathlon is overwhelming and fills you with pride once you cross that finish line! Me finishing the 2011 Trek Women Series Sprint Triathlon in Howell, MI. I am extremely excited to do the Trek Women Series Triathlon again this year, and I have my eye on completing a Half Ironman Triathlon within the next year. A Half Ironman is 70.3 total miles in length (1.2 mile swim, 56 mile bike ride and a 13.1 mile run). Training for a triathlon requires you to have a training schedule which includes all three triathlon elements. Although I swim to train for triathlons, there are plenty of people out there who swim as a cross training exercise when running. During the winter, when I am not in full training mode swimming is by far my favorite cross training activity, as I lap swim at the local high school at least 2 days a week. Cross training is important for runners! It helps balance our muscle groups, helps maintain and improve our cardiovascular fitness, reduces our risk of injury, and helps you avoid getting bored with running. As a runner there is nothing quite so soothing for muscles which are tired from the pounding of the road as the gentle massaging action of water as you glide through it. Swimming is a zero impact sport, and is the least stressful cross training activity you can do, so it is ideal when trying to come back from an injury. There is also something incredibly calming about immersing yourself in the calm and quiet of the water. With that being said, swimming is by no means a day at the beach either! No other activity comes as close to being the perfect full-body exercise as swimming. I can tell you from personal experience, that swimming uses completely different muscles that are neglected while running. Shoulders, arms and hips will get a huge workout while swimming. Swimming also demands special attention to your breathing patterns, and the control you learn breathing in the pool will translate to more efficient breathing while you are running. What do you do once you are ready to swim? Once you are dresses, paid and ready to swim you can head out to the pool. You will see where the staff has lanes setup throughout the entire pool or like at Mason, only a certain portion of the pool is setup for lap swimmers as they also have water aerobic classes going on at the same time. As a beginning swimmer try to pick a lane with no one in it. Having a lane to yourself will allow you to go nice and slow, work on your swimming technique, and if you are anything like me not worry about swimming in a straight line! (Two years later I still struggle swimming in the center of my lane!) If you end up having to share a lane with other swimmers, here is a great article on the etiquette of lap swimming with others. Do not worry about what other swimmers think. Just like my article the other day “The Self-Conscious Runner“ I can say the same thing about beginning swimmers. As a forewarning: although is may come across as rude, most swimmers are not chatty while in the pool. They will smile and be friendly, but for the most part they are there for a good workout and the time allowed for lap swimming is usually limited. If you have ever thought about cross training and are tried of the normal activities like biking, I strongly urge you to jump in the pool and give swimming a go!! !